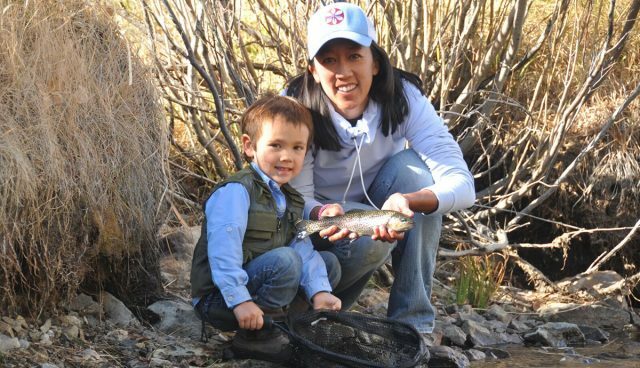 BD would like to introduce this month’s Fishin’ Chick, Michelle Bowman. This young lady’s passion for the ocean translates on many levels. She is a steward of the ocean for her 9-5 job and an avid SUP fly fisher-woman in her spare time. Michelle Bowman: I’m a marine scientist here in San Diego. In the past few years I’ve been focusing on environmental outreach and education. I also do water quality monitoring, sediment characterization, stormwater analyses, permitting and toxicity testing. I’m particularly passionate about water quality because I want it to be clean so my family and I can play and fish in it. It’s a great job! Michelle Bowman: Surfing, stand up paddling, yoga, photography, cooking, and food, traveling and watching football. I LOVE watching football and I make a mean batch of chili on Football Sunday. Michelle Bowman: That honor goes to my awesome husband. When we first started dating he told me he liked to fly fish and asked if I’d like to learn. I agreed and the next thing I know we were heading offshore for mako sharks. Mako sharks!!! On a fly rod? A few miles out we stop and he sets out the chum bucket. 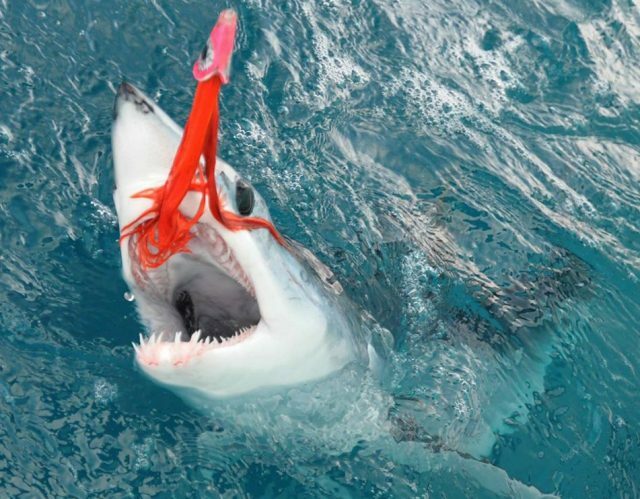 I ended up catching an 80-pound mako shark and haven’t stopped fishing since then. I love it and it’s the perfect complement to my passion for surfing. When there are waves I surf. When the surf is flat I go fishing. Sometimes I do both. I started board fishing almost right away because there were some fantastic kelp beds right in front of our house and are easily accessible using a longboard surfboard or stand up paddleboard. I started board fishing from my longboard but casting from the seated position was not as effective as standing up but that was all I had. Along comes the standup paddleboard…the answer to problem. Now I could stand up and cast which doubled my casting distance and allowed me to see farther away but still allowed enough stability to fight a fish (unless it’s too big). Now, if the conditions are right, I’d rather be on a board than in boat. Michelle Bowman: Our first fishing date was in mid-2004 so about 12 years. 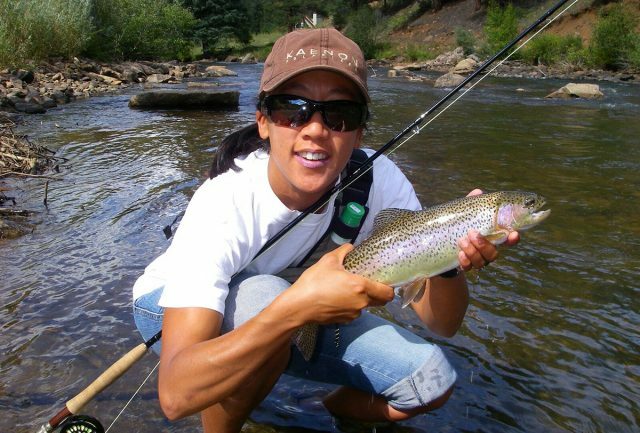 Michelle Bowman: I conventional fish and fly fish. Baitcaster, spinning reel, fly reel…if you can fish with it I’ll use it. Or no reel at all. I’ve tried a Tenkara rod and they’re really fun on smaller trout. They’re definitely a finesse rod. I’ve also done a fair amount of surf fishing since I live so close to the beach. Does a lobster net count? I’ve dropped those from my paddleboard too and caught lobster. My fishing adventures have taken me all over the U.S. including Alaska and Hawaii but also to Baja California, Belize, and the Yucatan Peninsula. 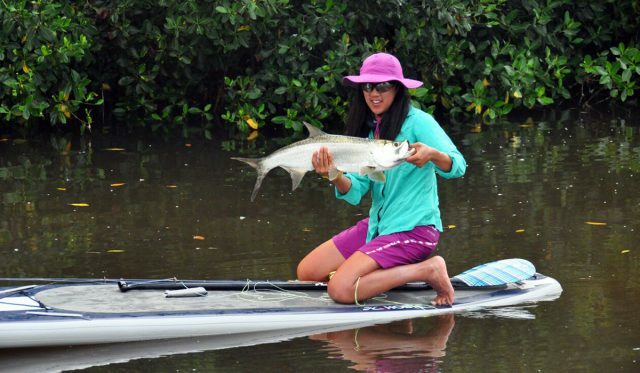 Michelle Bowman: Fly fishing from my stand up paddleboard is definitely my favorite. You can’t bring a lot of gear so you have to plan your tackle before you paddle out. It can also be very solitary…just you and fish. Even if you board fish with others around the battle is just between the two of you. And often, the advantage goes to the fish since I’m on a board and not a boat. Fishing with my family is just awesome. Watching my 6-year-old make his first solo cast with a spinning reel a few months ago was so exciting. He hooked up on his first solo fish on that trip too! I’m a proud fishing mom! Michelle Bowman: I’d like to do a lot more board fishing on the fly. 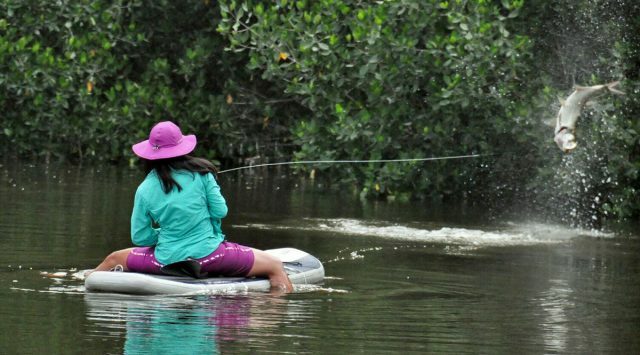 Fishing from a stand up paddleboard can take you to fishy water that is inaccessible to boats and now that there are high quality inflatable paddleboards you can travel with them fairly easily. There are several areas with flats that I would love to fish as well as more remote areas of the world that I would like to fish. Those include mangroves and flats on the Pacific side of mainland Mexico and around Belize, and Florida, reefs around Indonesia and Thailand. The birthplace of modern fly fishing, Scotland, is also in my future. I don’t imagine I’ll be taking a paddleboard but I would love to see the roots of fly fishing. I also plan on fishing with my kids. My older son is 6 and already enjoys fishing so I hope to get out on the paddleboard with him this summer and pull on a few fish together. So I guess my first goal is to teach both of my boys, ages 1 and 6, how to fly fish. My bucket list is long but I’ve got some time. 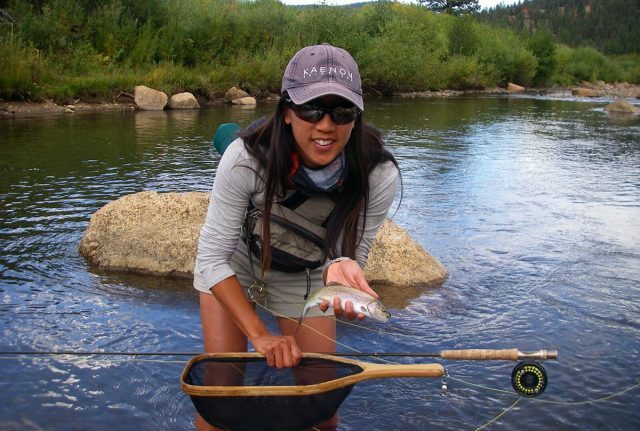 Michelle Bowman: There are several things I love about fly fishing in particular…it’s the hunt. As a marine biologist I like to understand what I’m going after. The fishermen who have been fishing all of their lives know so much about the fish they catch. This helps them figure the fish out and make them better hunters. I love that. 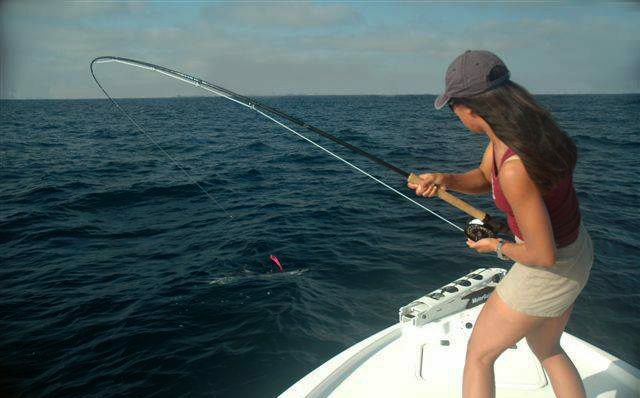 I also love board fishing on the fly all alone on a warm summer morning just offshore in San Diego’s kelp beds. I guess it’s the same for a trout fisherman along on a creek in the Rockies. It’s just me and the fish. It’s quiet. The only noise is the splash of bait here and there, the occasional crashing splash and maybe a tern plucking bait off the surface. BD: Tell us some of your proudest moments in fishing. 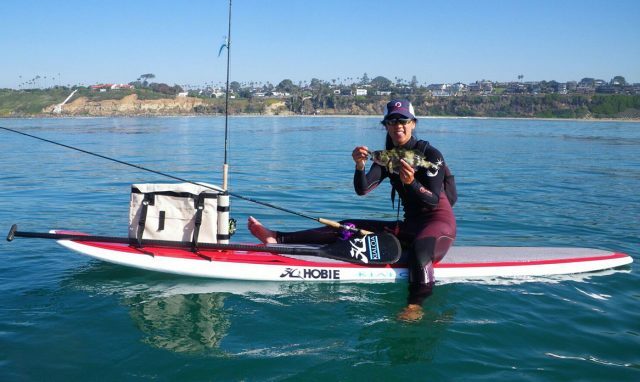 Michelle Bowman: Aside from my first fish being an 80-pound mako shark on a fly rod I’d say that my proudest moment was landing a 40-pound white seabass on conventional gear from my standup paddleboard. 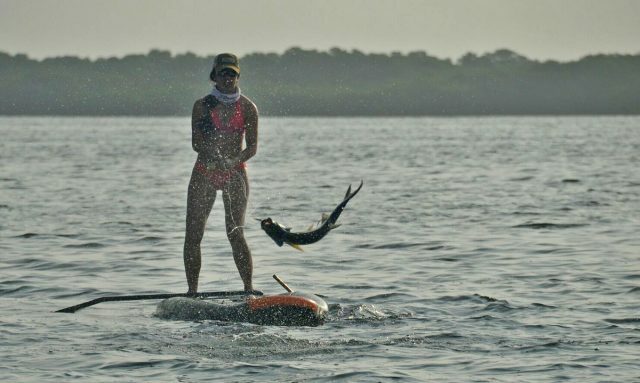 I was also pretty stoked when I got my first tarpon on my stand up paddleboard in the Yucatan. 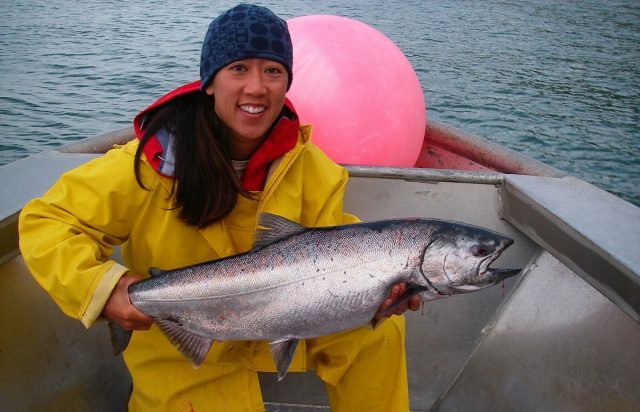 Michelle Bowman: I love all of the different facets of fishing. I think I got that from my husband. 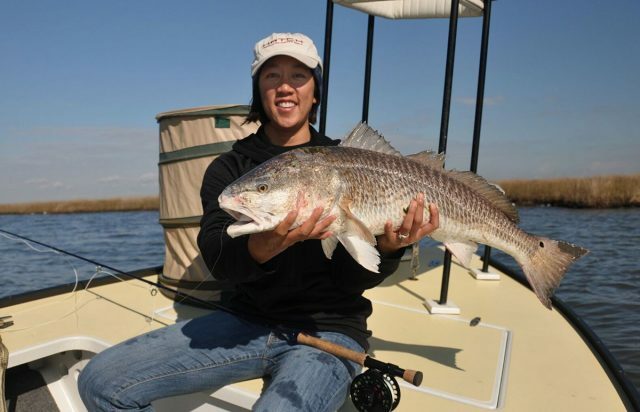 There’s always something new to try in fishing whether it’s tackle, location, species of fish, weather conditions or the people you fish with. I want to experience it all! I love fishing!